The village is located on the hilltop and is in the interior from the approach road. There is no permanent water source on the hilltop. Presently the people fetch water from the river which is not safe for drinking and this is available only for 8 months. Presently there is no drinking water provision for the school. After the implementation of the project a provision of a stand post will be made and school will have access to water from it. A total of 127 students (girls 61, boys 66) will benefit from this activity. The exact number is not available as it is difficult to record it. The approx. number is mentioned as per discussion with the village community. The catchment area is mainly on the sloppy lands which has lead to heavy run-off. The rainwater flows down stream with pressure and there is a scarce possibility of infiltration. Therefore, there is no ground water available on the top near to the residential area (colony). The Mula river flows at a distance of 1.5 km. from the hamlet at about 510 feet down in the valley. At the bank of this river from the existing well the water scheme has been established under the Govt. Scheme. Presently, the water is stored in the water tank of 4500 liters capacity. 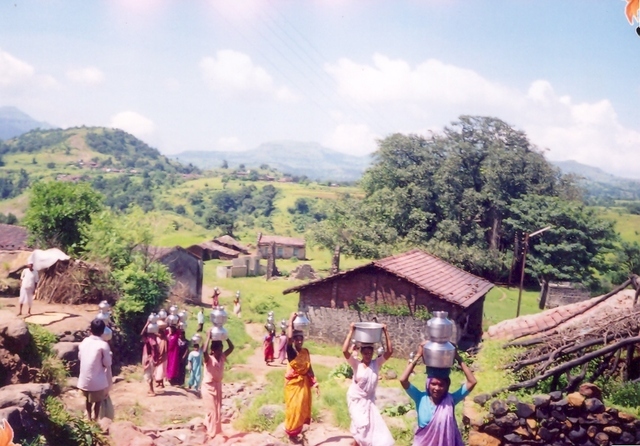 The women along with their children (especially girls) have to walk at least 0.5 km distance on the slopes till the water tank and again walk the same distance to the hill top with water head load. 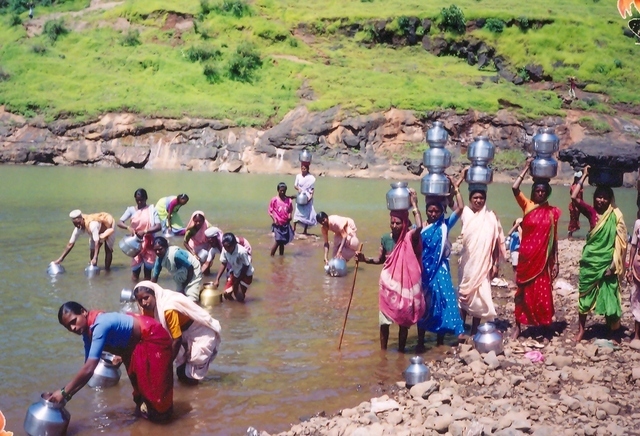 Everyday the women have to spend at least 3 to 4 hours daily to fetch water which increases the drudgery of the women. Considering the above problem the women member of the SHGs and the SMS have taken the initiative to solve this problem with the help of the Village Development Committee and the Gram Panchayat. The SMS and the VDC (Village Development Committee) has prepared a plan and estimate of the proposed drinking water project. It is planned to construct a new drinking storage tank of 20,000 liters capacity near to the hamlet on the hill top. An extension of 700 feet main pipeline along with 1265 ft. distribution supplementary pipeline will be laid down. A new motor of 7.5 horse power monoblock will be installed on the existing well. The water will be lifted to the water tank and will be channeled through 5 stand posts which would be constructed. The people are willing to contribute 15% of the total cost. They have submitted all the required documents. This project will be completed in one phase and the amount will be released in 3-4 installments. After the monitoring of the project by the WOTR officials (region and head office) the next installment will be released and so on. Due to the similarity to other WOTR proposals, we are going to not have others review this one; and use the reviews of the other proposals to decide on this one. Thank you for the message and have noted it.